Soft linen and beige tones, accented by a splash of gray-blue, establish the relaxed feel in the welcoming family room. It’s no surprise Kelly found inspiration in the Nancy Meyers’ film starring Diane Keaton and Jack Nicholson. Meyers, set decorator Beth Rubino, and interior designer James Radin have collaborated to breathe life into other movie sets in It’s Complicated and The Holiday. Their designs are so impactful that they act as characters in each of their films. 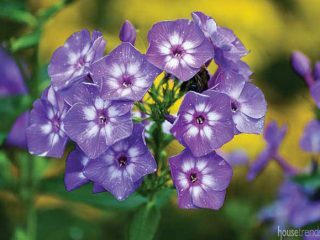 But Kelly and her husband Austin knew they needed a new home that would be functional and casual for their two daughters and five dogs. 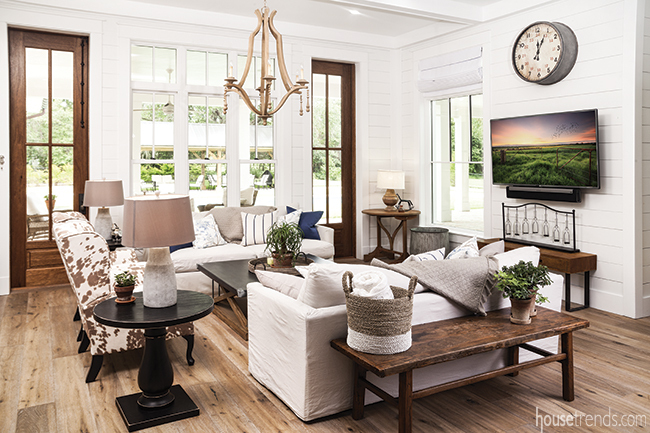 Luckily, about the time they started the design process Fixer Upper began airing on HGTV. 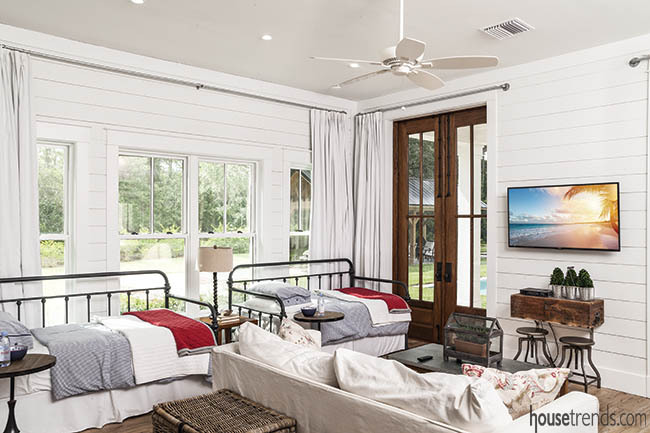 Thanks to Chip and Joanna Gaines, Kelly found the farmhouse feel that would add a touch of casual to the beach house inspiration she’d found on the big screen. 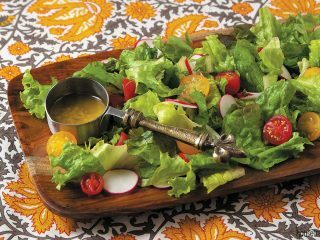 Kelly and Austin enlisted architect Jeff Smith of Aude-Smith Architecture to create the plans for their new home. 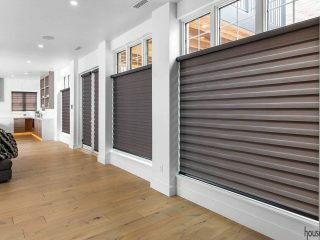 When it came time for construction, Kelly had a specific vision for what she wanted in her family’s home, and she pulled ideas from other people with great eyes. 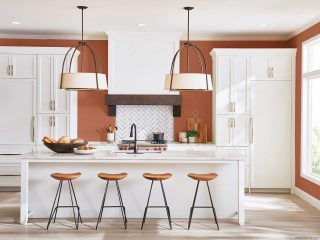 “Sterling Ridge Properties and Fine Wood Design were a huge help–especially when it came to decisions about the kitchen,” she says. Off the kitchen is the family room where eight people can comfortably watch the wall-mounted television. Two custom doors lead out to the pool deck. “This is where everybody hangs out,” Kelly says. During holidays or larger, more formal, gatherings people flow into the living room. The beamed, vaulted ceiling and fireplace bring a more sophisticated aura to the space. 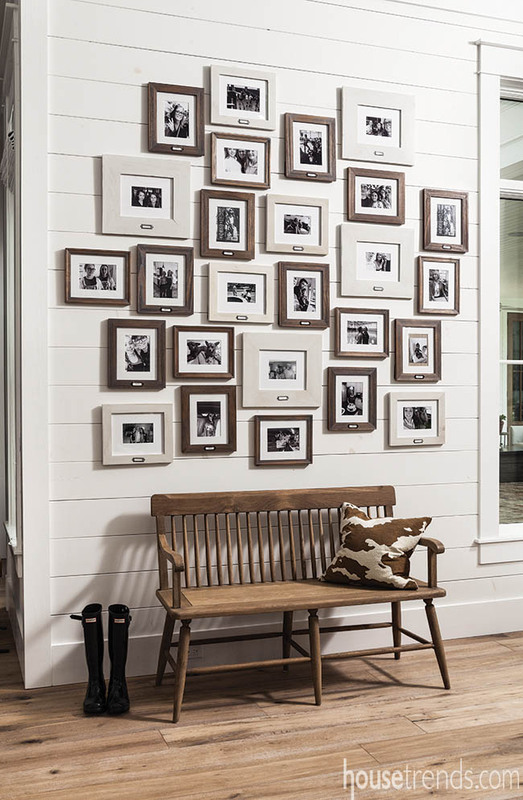 While a wall of black and white family photos keeps the space intimate and personal. Kelly is a designer in her own right. For years she had a sewing business with her mother, Jeanne Bauder. They created stunning drapery and upholstery. 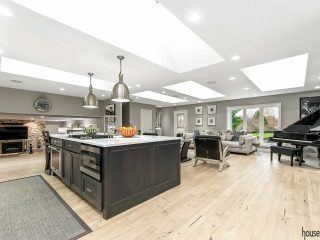 Now the duo does their collaborating for family and friends only, but they got to use their artistic eyes while designing Kelly’s own home. 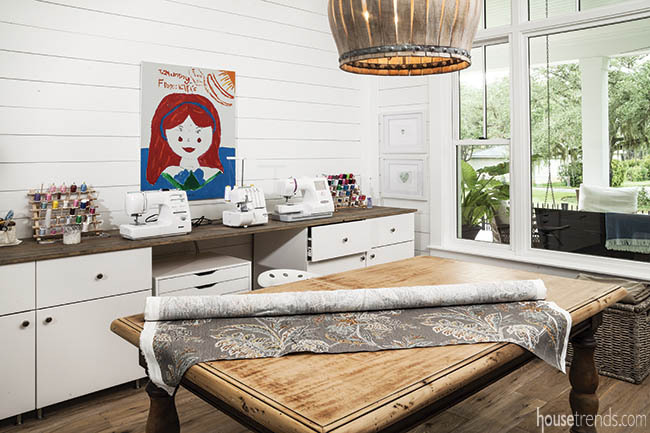 And they made sure to carve out a unique niche for their sewing room. 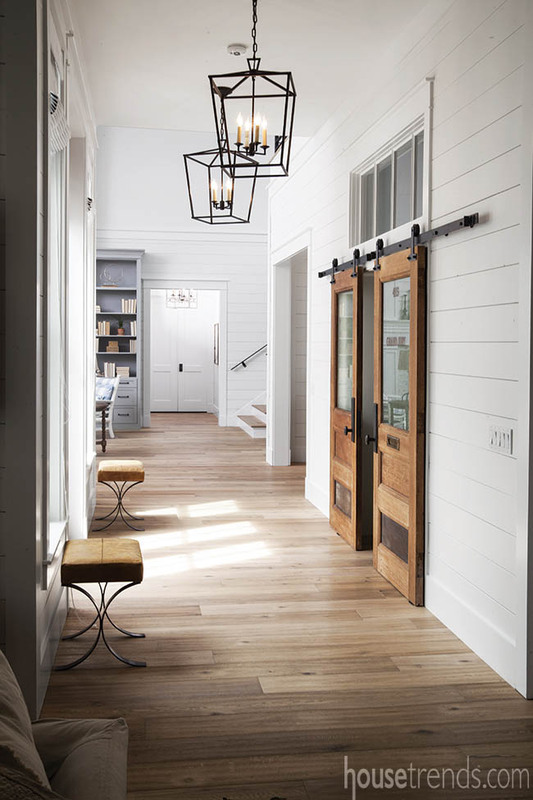 Off the main hall of the home are two antique doors hung on barn door tracks that lead to Kelly’s sewing retreat. 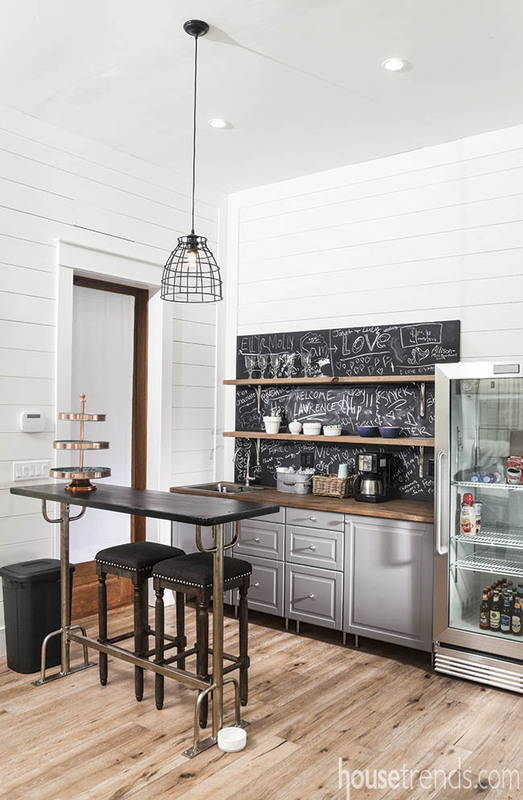 The stained wood doors are prominent against the white shiplap walls; and the interior windows above the doors give the space an old schoolhouse feel. Two iron-caged light fixtures flank the doors. 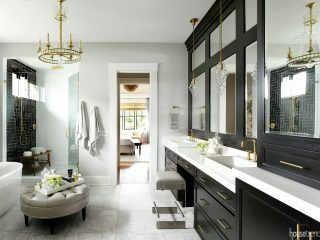 It was important for Kelly that the master suite be located on the opposite end of the home from the kitchen and family room. It is situated behind the formal living room, down its own private hall off the staircase that leads to the girls’ bedrooms upstairs. The master bedroom is a serene space with a minimal, muted color palette. 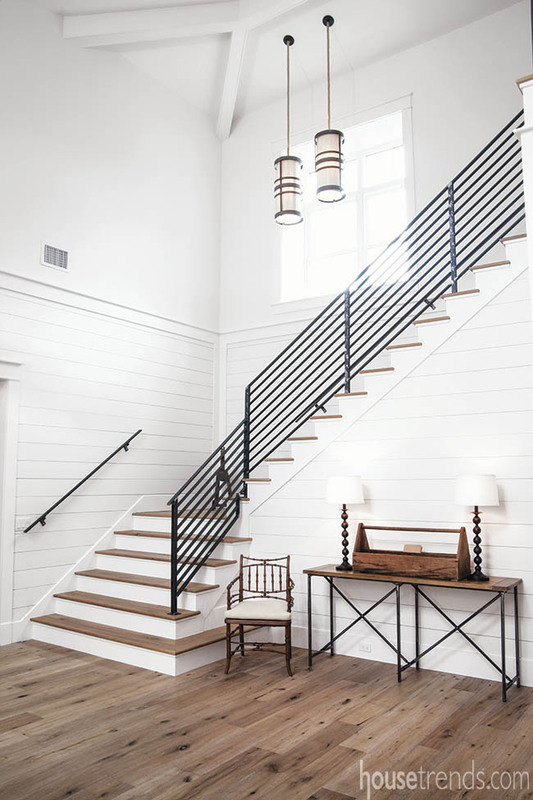 “Dominick loved all the shiplap in the house,” Laura explains of the wall detailing that can be found in the master bedroom. The Simmons have a large extended family and two teenage daughters, so it was important to her and her husband that they create a separate retreat where houseguests could escape away from the main house. Thus, the family decided to build a guesthouse by the pool. This cozy space is one room with all of the amenities any guest could desire, including a bathroom and kitchenette. The two daybeds and pull out sofa provide ample sleeping room, and the space is great for the girls’ slumber parties. But the guesthouse has become more than a retreat for family and friends. The Simmons family has graciously opened this space to a family from Nicaragua whose young son receives medical treatment at Shriners Hospitals for Children. The mother will be bringing her son back as he grows and requires new prosthetics, and they will always find a place to stay at the Simmons’ home.